Apparently your cory catfish have been, ahem, gettin’ busy, and there are white little eggs all over your glass. Babies! So what in the world do you do now? 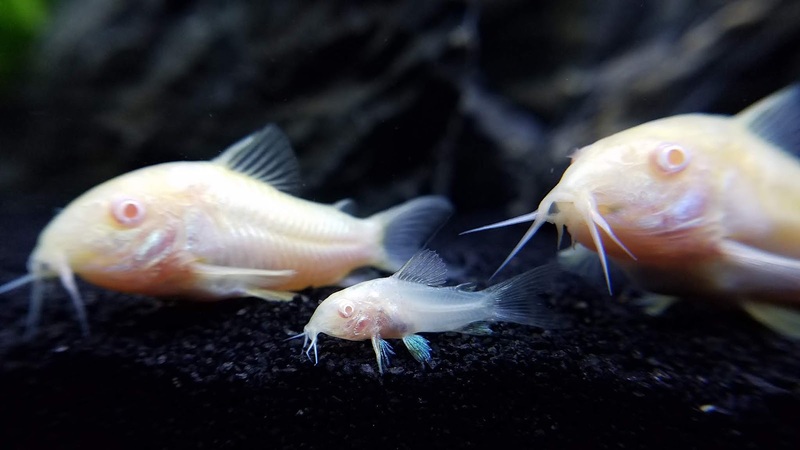 Keep reading to learn everything you need to know about raising corydoras fry. Okay, for most of you, breeding corydoras was probably an accident, but here’s what you can do to encourage it. 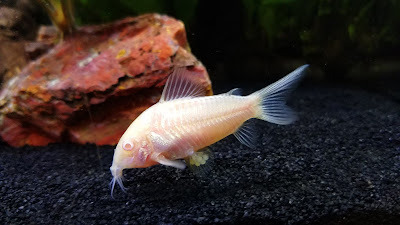 For me, I had a 20 gallon tank with 6 adult-sized albino cory catfish (to increase my chances of having enough males and females). To get them in the mood, condition them by feeding lots of good food, and then do some water changes with fresh water a few degrees cooler than normal. 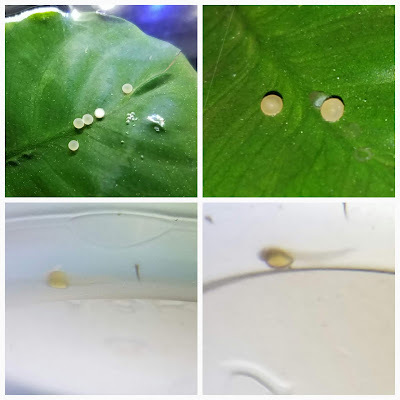 Next thing you know, everyone’s gettin’ frisky, the males are chasing the females and doing the T-shaped mating position, and then the female lays sticky eggs on any ol’ flat surface around. If you leave the eggs alone, it’s like a natural form of population control because most of them will get eaten. 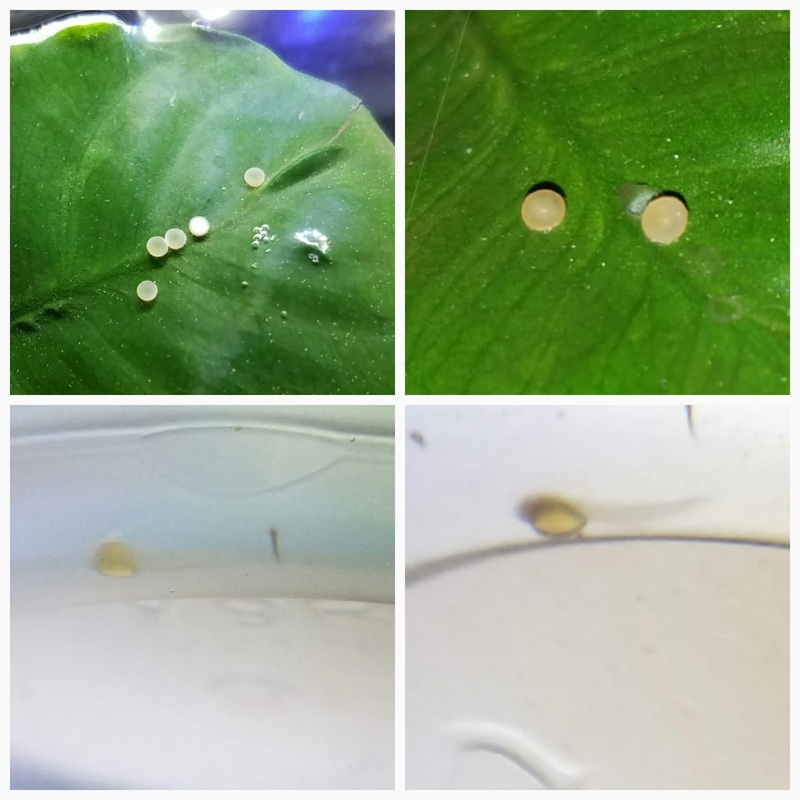 However, if you want maximum survival rate, remove the eggs with a credit card or your finger (my preference) and put them either in a grow-out tank or use a smaller container with no holes that floats in the main tank. Add an air stone for gentle water agitation and put a few drops of methylene blue to prevent fungal growth. And then perform daily 50% water changes as needed. The fertilized eggs turn clearish yellow-brown, whereas the unfertilized eggs turn solid white. Remove the unfertilized eggs so they won’t grow fungus that spreads to the fertilized eggs. After the eggs hatch in 2 to 5 days, clear out the methylene blue from the water. I’ve used both breeder baskets and grow-out tanks, and I now prefer the latter. 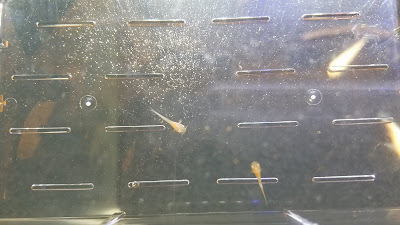 My plastic breeder basket had slits at the bottom that the fry kept falling out of (when they were less than 3 weeks old), and the mesh breeder basket had corners that the fry kept getting stuck in. The grow-out tank I used was just a 10-gallon clear plastic tub I normally keep as my quarantine tank, and I feel like the larger volume kept the water cleaner and gave the fry more swimming room to avoid stunted growth. To keep the water quality high, I did 50% water changes 3 to 4 times a week with a large siphon, covered with a filter media bag and thick rubber band to prevent casualties. To remove fish waste or uneaten food, you can siphon with airline tubing. I like to tie a chopstick to the vacuuming end (for easier maneuverability) and then clamp the other end of the tube into a net or bucket so you can catch any escapees. In the first 1 to 2 days, the cory catfish are still feeding off their yolk sac so don’t give them anything to eat. After that I feed the fry about 2 to 3 times a day. Each week I introduce a new kind of food and then alternate between the different foods for greater variety and nutrition. Week 1: I feed Hikari First Bites or other powdered fry food. Don’t use your fingers because the dust just gets stuck under your fingernail. Just stick a chopstick in the bag to collect a little food and then swirl it around in the fry tank to make the powder sink. I don’t use egg yolk because it’s too messy and crushed flakes float too much for the catfish fry to reach. Week 2: I add frozen baby brine shrimp to the menu. It kinda looks like pink liquid when you feed it to them because the particles are so small. Week 4: The fry now get frozen daphnia or frozen cyclops, depending on what I can find at my local fish store. Once the fry can eat adult food and they’re too big to be eaten by the other fish, they can join adults (usually around 1.5 to 3 months old). Remember, the longer they spend in fry tank with no food competition, the faster and bigger they’ll grow. With my first batch of eggs, I ended up with about 15 healthy fry that were big enough to join the community tank. However, that means my aquarium is kinda on the overstocked side. 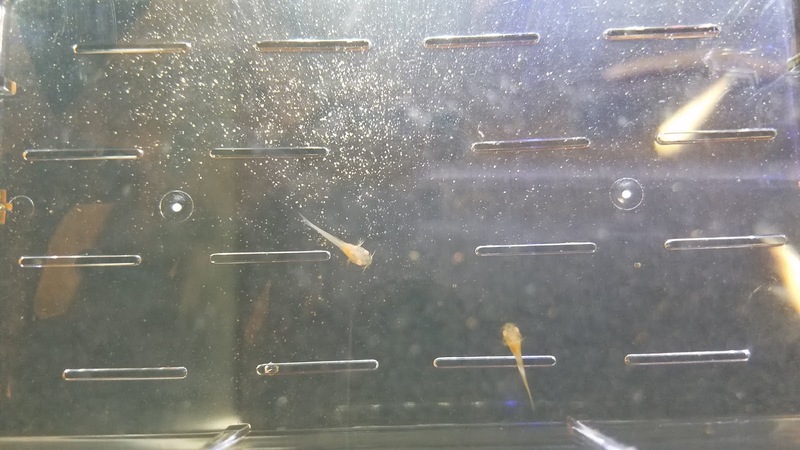 If you’ve got a population boom, consider giving fry away to friends, selling them through your local fish club or Craigslist, or giving them to a fish store (where you may or may not get store credit). Unless you have a super rare species of corydoras, you’re probably not going to get a lot of money from them, but hey, most of us are in this hobby because we love it, not necessary to make rent. What’s your favorite type of fish to breed and why? Comment below so I can get some ideas for my next breeding project. If you like this video, hit that subscribe button and follow me on Instagram for daily updates. Good luck with your cory catfish and I’ll see you next time! So You Want to Breed Corys?